PETALING JAYA: Multi-Purpose Holdings Bhd (MPHB) will be announcing its joint venture (JV) with a public-listed developer in the next several weeks to mark its entry into the property development sector. MPHB MD Datuk Lau Kim Khoon pointing the way forward for the company: It is in property development. He says ‘We do not have the expertise but we have the land'. So a joint venture with someone who has the expertise is the answer to increase profit. Besides gaming, its other businesses are insurance, stockbroking, property and hospitality. The group is starting from ground zero in property development as other than its two residential projects which it launched early this year in Penang, it does not derive any revenue from property development. The group has two office buildings, Menara Multi-Purpose and Plaza Flamingo, and two hotels under the Flamingo brand as investment properties. Menara Multi-Purpose is 98% occupied and Plaza Flamingo, 90%. “In the past, MPHB has been factoring in the recurring income from these assets but the contribution was not substantial. The current contribution to the group’s revenue from property development comes mainly from two residential developments in Penang which are expected to contribute a total of RM37mil in profit before tax when completed in the next three years,” said Lau. The Paya Terubong project is a six-acre joint venture comprising 116 units of town houses and 256 apartment units with a gross development value (GDV) of RM72mil. The Minden Heights project is another JV comprising 74 units of terrace houses under phase 1, launched early this year, and 95 units of terrace houses under phase 2, which will be launched at the end of this year. The GDV for this project is RM143mil. The group is also converting Magnum Plaza into a three-star hotel to be part of its Flamingo chain. This is expected to open next year. The jewel in the crown, Lau said, would be its RM3bil iconic integrated mixed development project at the junction of Jalan Sultan Ismail and Jalan Imbi near Park Royal Hotel, which is currently in the planning and designing stage. It was reported last week that MPHB will launch a RM3bil project which will complement the Government’s proposed international financial district and Pasar Rakyat redevelopment in Imbi. The 2.4ha will have a retail podium, a 50-storey luxury condominium, a 35-storey four-star hotel and 30-storey office tower. The entire project will take several years. On the occupancy prospects of its KL integrated mixed development in view of the weak global economy and dwindling expatriate community, Lau said MPHB’s projects were not designed exclusively for expatriates but for the working class. Only a small portion will be condominiums, as such occupancy and oversupply will not be an issue, he said. “We do not have the expertise but we have the land. So we will work with the parties that have the expertise. It is not necessary to have our own property team to undertake these developments. The objective is to build a sustainable recurring income stream from our investment properties,” he said. Lau said most of its land were bought and paid for years ago. Over the years, they have appreciated by three- or four-fold. He said property development and investment is expected to contribute 10% to the group bottomline. “Revenue from the property sector will contribute between 20% and 25% in about three to four years’ time,” he said. He said the bulk of its landbank, which includes a 4,641-acre oil palm estate in Pengerang, Johor, which is near the third link to Singapore, are generally more suitable for the local market. TRADEWINDS Corp Bhd, which is undertaking the RM450 million refurbishment of the 29-year-old Menara Tun Razak in Jalan Raja Laut, forsees office rental in the building to increase by 40 per cent by 2014. Chairman Tan Sri Megat Najmuddin Megat Khas said office space in the building was currently rented out between RM3.50 and RM4.50 per sq ft and this would be increased to RM6 per sq ft. He said the redevelopment activities would result in a temporary decline in the rental income from the group's property division. 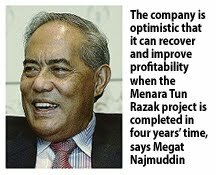 "Barring any unforeseen circumstances, we expect to see rental income to decline by RM8 million annually, but we are optimistic that we can recover and improve our profitability when the Menara Tun Razak project is completed in four years' time," Megat Najmuddin told a press conference in Kuala Lumpur yesterday, after the company's annual general meeting. Tradewinds will also construct a 40-storey office building, next to the Menara Tun Razak, later this year which will be crucial for the company's property development business. "The development would enhance the area in terms of asethetics and value, increase our profile as a major high-end urban property developer, attract new and reputable clientele as well as create spill-over effects for surronding areas," Megat Najmuddin added. He also said the company planned to set aside RM70 million to refurbish three other hotels under its wings, PJ Hilton, Hilton Kuching and Pelangi Langkawi. PETALING JAYA: Tradewinds Corp Bhd will spend RM450mil to refurbish Menara Tun Razak (MTR) as well as build a brand new 40-storey office block on the existing land just beside MTR. Tradewinds has just received the approval for the new office block and will start developing the 5-star office building this year. The building is expected to be completed by 2014. “We are building a commercial building for tomorrow’s standards. The office block fulfils 95% of the checklist of some of the best buildings in Singapore,” said Tradewinds Corp director and advisor Poh Pai Kong. Currently, MTR is generating net cashflow of RM8mil per annum. Hence, from now until the refurbishment is completed in 2014, there will be a loss of some RM8mil in cashflow. However Poh said the refurbishment was likely to be completed before 2014. He also emphasised that the refurbished building would fetch higher rental yield. The existing rental for MTR is RM3.50 to RM4.50 per sq ft (psf). Once refurbished, MTR will be rented out at RM6 psf. “The new office block will be rented out at RM6 psf for the first three years before we increase it in the coming years. If you look at Jalan Raja Laut, where MTR is located, it is increasingly becoming a bankers’ street. When you have a 5-star building, you are able to rent it to anyone,” said Poh, after the company AGM. Tradewinds chairman Tan Sri Megat Najmuddin said property development was a catalyst of growth for Tradewinds, with commercial property as its focus. Poh added that the refurbishment of MTR was a mere appetiser before the company served its main course. “We are now looking at all sorts of projects. We are reviewing all our existing assets and developments. The property drive will be the catalyst moving forward for us,” he said. Megat said that he was optimistic about the property outlook of the country despite many people criticising Malaysia. When asked whether Tradewinds would enter the residential property market, Poh said it was something they were looking at. One of the projects Tradewinds is planning for will include service apartments. Meanwhile, Tradewinds will spend RM70mil over the next two years refurbishing three of its hotels, which are PJ Hilton, Kuching Hilton and Meritus Pelangi Beach Resort & Spa Hotel in Langkawi. Right now, its gross operating profit for its hotels is around 40%. Sunway Holdings Bhd expects a record net profit this year, driven by new business and healthier margins from all its five core divisions, managing director Yau Kok Seng said. These include construction, property development, trading and manufacturing, quarry and building materials. The construction division, which has RM3 billion worth of jobs in hand, is bidding for more infrastructure and building projects worth RM16 billion in Malaysia, Abu Dhabi, India and Singapore. "We hope to get minimum RM1 billion worth of new contracts this year, maintaining our order book at RM3 billion," he told reporters yesterday after a shareholders' meeting in Bandar Sunway, Selangor. Sunway, controlled by founder Tan Sri Jeffrey Cheah, has prequalified for projects like the light rail transit (LRT) line extension in the Klang Valley, the new low-cost carrier terminal in Sepang and the Kelau dam, part of the Pahang-Selangor raw water transfer project. Yau said Sunway's property development unit, SunwayMas Sdn Bhd, will launch five projects, including one in Singapore, from July to December this year worth RM600 million. It has six projects worth RM1.1 billion and 182ha of undeveloped land with potential to generate a gross development value of RM3.3 billion. "With new construction jobs, property launches and unbilled sales of RM515 million, and increasing trading, manufacturing and quarry activities, we hope to exceed last year's earnings," Yau said. Sunway reported a strong first quarter net profit of RM40 million, which is 2.5 times higher than in the same quarter last year. "We have very clear strategy on how we want to build our businesses. The geographic diversification has helped us grow all the divisions. "To expand further, we will continue to recruit the right talent and manage the foreign exchange rates," he said. Sunway, which has RM170 million in its reserves, has no immediate plans to do a rights issue, he said. Yau said Sunway will manage its cash flow, generated from all its operations, to expand. "We hope to come up with a consistent dividend policy from next year. We are looking to distribute 20 per cent of our profits to shareholders," he said. KUALA LUMPUR: MALAYSIAN RESOURCES CORP Bhd is expanding its landbank near in landmark KL Sentral development by acquiring a company which owns a piece of land fronting Jalan Brickfields for RM105 million. MRCB said on Wednesday, June 30 it had proposed to acquire 22.82 million shares or 60% stake in GSB Sentral Sdn Bhd with 17.91 million redeemable preference shares of 1 sen each in GSB for a total of RM105 million. It is acquiring the stake from Gapurna Sdn Bhd, which is principally engaged in property development. GSB Sentral owns 91,040 sq ft of land which has been approved for a mixed development of office and service apartments with total gross floor area of 1.468 million sd ft and an estimated gross development value of RM850 million. The development on the lot started in March 2009 and is expected to be completed by the fourth quarter of 2012. GLOMAC Bhd’s net profit for fiscal year ended April 30 rose 27.4 per cent to RM40.7 million, driven by contributions from its Sg Buloh township and Glomac Tower commercial project in KL. Revenue was down almost 8 per cent to RM317.8 million. Going forward, Glomac expects significant growth, helped by unbilled sales of RM588 million, and pipeline projects worth RM1.8 billion, over the next 2 years.